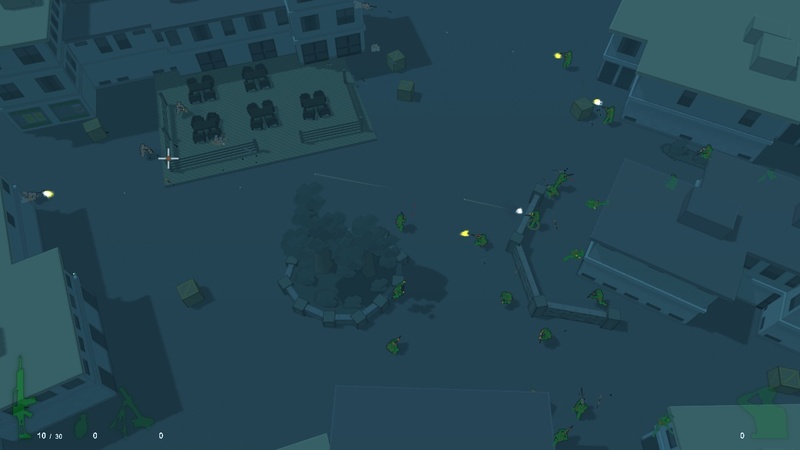 Running with Rifles by Modulaatio Games is a new top down sandbox shooter featuring an open world battlefield divided between two factions where each one is trying to capture bases from the opposite side until the enemy has been wiped out from the area. The player takes the role of a private and fights along comrades controlled by AI, slowly gaining influence over fellow soldiers through rank promotions from success in battles. The game is made by using many open source tools - OGRE for graphics, OIS for input, OpenAL for audio, ENet for networking etc. However, Running with Rifles is currently available for Windows only. But in future, the game will be ported to Mac and Linux as game developer Pasik has shown interest making it cross platform. It is very possible to implement a Linux/Mac port thanks to the cross-platform libraries RWR utilizes, and it's highly likely the port will be made next spring. Rooftops, water areas, server browser & dedicated server support, more details and props, several new maps with new themes, new factions and more factions in one battle, Linux/Mac port, eventually vehicles.. all these major features, all the minor features in between and the bug fixing will keep me pretty busy for the next spring. Running with Rifles Windows version is currently available for 5.25 EUR + taxes. A free demo is also available for trial.